Our three quarter size resin Guernsey Cow statue, and comes with footplates on the inside of it's hooves. This model Guernsey Cow is extremely life-like. The high quality of the modelling on this figure along with the excellent textured hair -like finish and the realistic paint work. We can supply this model in a textured finish and also Smooth, please contact us for more information. This Guernsey Cow is ideal for a farmyard themed areas, advertising or drawing attention to your farm-shop, dairy or just to go in the garden to confuse the neighbours! 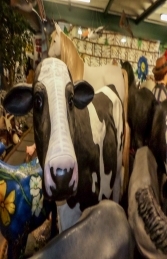 This resin and fibre-glass Guernsey Cow statue looks wonderful with our other cow models to create a small herd.